People know him as Agent 004, the hard tackling defensive midfielder that other players fear. But what Milan fans learned right away is that the fabled “hard man” is soft as a teddy bear on the inside, and a devoted family man. Or if they didn’t realize it before, his tearful exit from the club after only 18 months certainly betrayed his hardened reputation. I will be the first to admit that I was one of his skeptics when he first came to Milan. But he quickly won me over and I realized, that like much of the footballing world, I had seriously misjudged him. Yes, he could tackle hard, yes he had been known to lose his temper on the pitch, but luckily for Milan, he seemed to be leaving that part of his career behind. In fact I noticed that even the “dirty” tackles that earned him cards were actually usually very calculated and crucial to some of our victories. But what I had never looked beyond the label to see before were his incredible passing skills. For example. Did you realize that in Serie A this year, he averaged 62 passes per game? With an 88% pass success rate? (according to whoscored.com) In fact, he was often near the top of most passing stats, his secret weapon hidden beneath his hardened reputation. But I didn’t need stats to see his contributions on the pitch. We always played better with him on the pitch, even when he had an off day. He made that center defensive mid position his by just doing what he does best: playing his heart out. He is a model teammate and never makes excuses. He protects his defense, helps maintain possession, and would do his best to join in the attack whenever he could. I honestly don’t even know where we would have been this season in the Champions League without our favorite teddy bear… er…. hard tackling Dutchman. One of my favorite memories will be the way he owned Netherlands teammate Wesley Sneijder in the second derby last year. 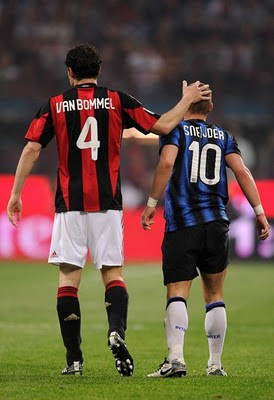 I thought Sneijder was just going to explode, van Bommel frustrated him at every turn. And then, after the whistle, van Bommel just patted him on the head like a father who had just schooled his son while he still could. It was moments like these that nearly gave away his secret identity, as he was so jovial and kind outside of the 90 minutes on the pitch. But I suppose some of his tackles make it hard for opponents to forget, so I think his identity may only be known to us. Another clue that tipped me off about his secret identity was during the Scudetto celebrations last year. Watching him with his beautiful children, it was so obvious that he is a devoted family man, hardly the man people paint him to be. And while he was quickly grafted into Milan’s family tree, it was ultimately the call of home and possibly following in the footsteps of extended family that pulled him away from his new family at Milan. 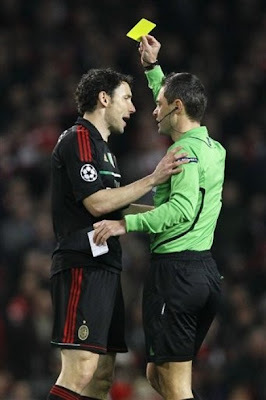 It is widely known that van Bommel was interested in taking his coaching courses in the Netherlands. His father-in-law, Bert van Marwijk is the manager of the Dutch national team, and van Bommel apparently wants a career in coaching as well. By accepting PSV’s contract, van Bommel will be able to complete his courses simultaneously and play with just a little bit less pressure, too. And I’m sure his family won’t mind being in a more familiar environment, too. It’s the perfect scenario for the Dutch captain, but not so much for us grieving Milan fans. In fact, I actually have a hard time believing that anyone can’t see through his poorly veiled image as a “hard man.” He is a champion in his own right, having won league titles with 4 different clubs in 4 different leagues. While playing, he tops the stat charts for passing and completion, and there are tons of images of him with his sweet family, as well as images of winks and smiles and handshakes during and after each 90 minutes on the pitch. He is not only a champion of the highest level, but also a true gentleman. Who will jump on Ibra's back now when he scores? But don’t tell anyone. His teddy bear center wrapped in his “hard man” image helps him on the pitch by increasing the fear in his opponents. If they can’t see his soft center, then they are missing the mark. 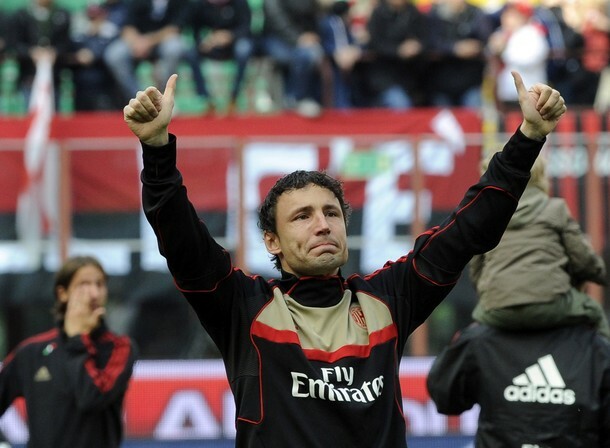 And speaking of missing Mark, I am not sure who cried more at his Milan departure, him or us. Maybe for some, it is the case of you don’t know what you have until it’s gone, but for those of us who knew his secret identity, we know we are losing a Milan treasure. 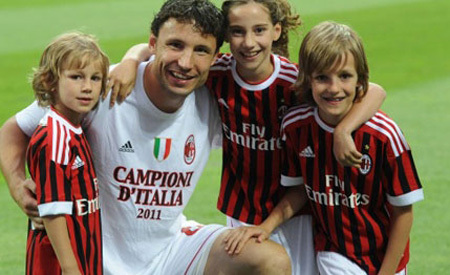 Ciao e grazie, Mark van Bommel, your secret is safe with us.